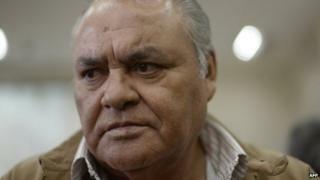 A former Guatemalan police chief has been sentenced to 40 years in prison for his role in the 1980 deadly raid on the Spanish embassy in Guatemala City. Thirty-seven people burned to death in a fire triggered by a police raid. Police stormed the embassy after a group of activists had occupied it to draw attention to government repression during Guatemala's civil war. Pedro Garcia Arredondo was found guilty of ordering officers to keep anyone from leaving the building as it burned. Among those killed in the fire was Vicente Menchu, the father of indigenous rights activist and winner of the 1992 Noble Peace Prize, Rigoberta Menchu. Indigenous rights and rural activists occupied the Spanish embassy on 31 January 1980, at the height of Guatemala's civil war between the government and left-wing rebel groups from 1960 to 1996. According to United Nations figures, almost a quarter of a million people were killed or forcibly disappeared during the 36-year-long conflict. The activists wanted to protest against a series of massacres of rural and indigenous people carried out by the government. They chose the Spanish embassy because they suspected its officials would be sympathetic to their cause as a number of Spanish priests had been among those killed. The court in fact found that Spanish Ambassador Maximo Cajal y Lopez knew of the plans to occupy the embassy. Thirty-four activists peacefully occupied the building. The police stormed the building and after a gas canister carried by one of the officers exploded, a fire spread. According to the court, Garcia Arredondo ordered police to seal the embassy and prevent anyone from leaving. Speaking in court, one witness said Garcia Arredondo had told his men: "No one gets out of there alive!". Among the 37 people killed were the Spanish consul and two Guatemalan politicians who had been visiting the embassy, former Vice-President Eduardo Caceres Lenhoff and former Foreign Minister Adolfo Molina Orantes. The only ones to survive were the Spanish ambassador and activist Gregorio Yuja. Mr Yuja was abducted from the hospital where he was being treated for burns sustained during the raid and tortured to death. His body was dumped on the grounds of a university whose students had supported the activists. Garcia Arredondo was sentenced to 40 years in jail for murder and crimes against humanity in connection with the embassy siege. He was given another 50 years for the killing of two students at the funeral of the victims of the embassy siege.